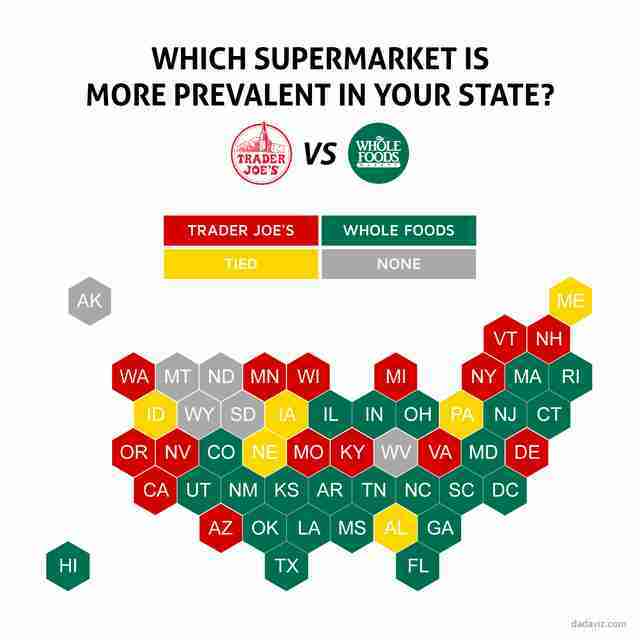 Trader Joe's vs Whole Foods: Which Is More Common in Your State? Whether it's artisanal chia wafers or small batch cheese puffs, when the time comes to restock your pantry with mass-produced hipster foods of any kind, there are really only two supermarkets to choose from: Trader Joe's, and Whole Foods. While the choice often comes down to personal preference (or budget, since Whole Foods is ripping us all off), a new map on Dadaviz shows it might also depend on what state you're in. Using store location data from both chains' respective websites, Dadaviz user León Markovitz put together the unnecessarily hexagonal map below showing which of the two beloved grocery-getting chains is most prevalent in every US state. While some states (like Alaska, the Dakotas, and, inexplicably, West Virginia) don't have either store, and others ended up in an unsatisfying tie, Trader Joe's made a strong showing with 15 total states under its belt. Nonetheless, Whole Foods came out on top nationally by claiming 24 states -- unsurprising, considering how much larger the Whole Foods brand is. 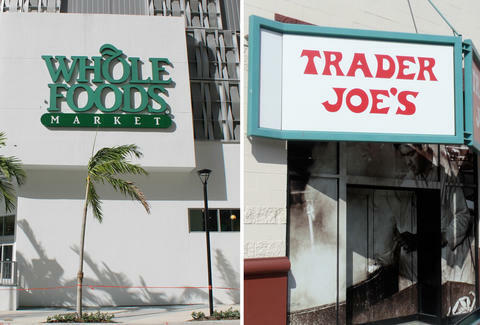 Still, as long as their prices remain astronomical, there'll always be a chance for slightly-more-underdog chains like Trader Joe's to unseat the great green monolith.